MyCrypt ™ is a data protection system that combines guaranteed identification, access control, and an advanced encryption system into a single easy to use and manage system. MyCrypt ensures that the individual (sender or recipient) is the person they say they are (guaranteed identity) and that they are authorized to access the requested application or data. 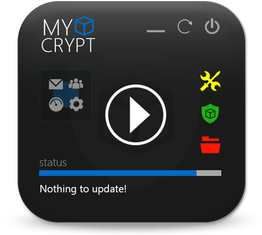 Once properly authenticated, MyCrypt decrypts/encrypts the application or data and allows the same to run or be used like any other application or data. Upon saving or transmitting this data it is re-encrypted with a new algorithm generated at that moment. The biometric data is never stored in raw or processed form. The biometric reading is obtained/and then used to generate a unique ID and is destroyed in volatile memory immediately. The system is a match-on-chip based system. All devices used for the biometric function are FIPS 140-2 certified devices. In fact, the area that does the processing on the chip is not accessible outside of that particular area. The reading is taken and passed into the protected/encrypted area on the chip. It does the validation by generating the ID with the bio info and the other data points to create the ID. This ID is sent to be compared outside of the bio processing area to validate the user. The data is then cleared and the device unlocked if successful. MyCrypt ™ Public Cloud SAAS – Unlike the normal meaning of “Software-As-A-Service” this is actually System-as-a-Service. This is closer to a cloud offered Infrastructure construct. With this approach a cloud instance is created and dedicated to your organization. Only devices that are created within your organization could access this area as a check for authentication is performed prior to doing an action and periodically during use. This ensures that only the authorized device possessed by an identified and authorized person can access the system. No customer data of any kind is stored in this instance. Only an encrypted data store that knows the Secure ID and Electronic Serial number of the device in use is stored. Private Cloud SAAS – Same functionality as the Public Cloud based system with the exception that the instead of being an instance in the cloud it is a security appliance that is housed within the local network. 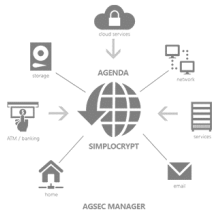 This offering is typically used for those organizations that have a local policy requiring all interface to be within their environment and unable to connect directly to the internet even through secure tunnels for validation. This option also allows for more robust reporting and features that are not available on the public cloud based solution.